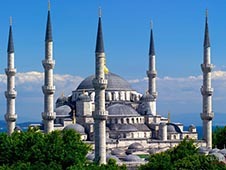 Istanbul – it is a unique city, one of which is in Europe, and the other – in Asia. Istanbul is divided Bosphorus Strait, which is spanned by two majestic bridge. Part of the city, which is on the European continent, has not lost the charm of a medieval consists of Beyoglu and Karakoy district. Üsküdar – this is Asia, where the coast of the Marmara Sea is rich in villas and military buildings. Throughout the city you can find a wealth of historical and architectural monuments, which were built in the period of Byzantium, Rome and the Ottoman Empire. Traveling to Istanbul, you can not miss the familiarity with the area, where there are just two major architectural miracle of the 15th century: St. Sophia Cathedral with mosaics and minarets, as well as the Blue Mosque. Istanbul stands and Topkan Palace, which is of great interest for tourists. There can still be seen with their own eyes the ancient Sultan's bedchamber and harem. Travelers who want to walk to the shops, have a great opportunity to do it in countless stores Laleli district. 50 busy streets huge covered market "Grand Bazaar", and where nearly 5000 stores, shopping fifty yards, lots of shops and cafes. It is in this wonderful place recommended to buy souvenirs of travel, antiques and jewelry. Walk through the streets of the city on foot, but you can on the car, which provides online rental firm bookingcar.ru. Moving through the exotic Istanbul at the wheel of their own, albeit temporary, transport, you get to see a lot more amazing places, plan your trip, avoid the permanent presence of noisy tourists, just choose your convenient routes. You can rent a car ahead of time, leaving a request on the site, or directly to the city airport Ataturk. Going on a journey through the city, you need to become familiar with the subtleties of the local rules of the road to avoid unpleasant incidents and surprises. Stir in Istanbul right hand, but it is necessary to know that Turkish drivers often ignore this rule and go middle of the road. Behind the wheel of a rented car can not talk on the phone if it needs to let go of the steering wheel. If you have a wireless headset - you can talk to. All passengers must wear a seat, and the one who sits in the front seat, and those who are in the background. The driver is also obliged to use a seat belt. Dipped need include only at night, and if the daytime visibility decreases due to the weather. Children can not be transported in the front seat if they do not have another 12 years of growth or less than 1.50 m. Allowed the presence of a child in the car in the rear seat. Rules require police to make way for cars, ambulances, fire services, civil defense, protection. The car should be reflective plate 2 and a first aid kit. The city has an existing traffic lights that regulate traffic. Sometimes, especially when traffic is heavy, at the crossroads of the inspectors-controllers on duty. The city has several types of parking. Park the car can be anywhere where there is no prohibition signs. But doing so is difficult because of the huge traffic flow. In addition, the free space can be occupied by guests and locals: in the first case did not allow to leave the car guard, and in the second you can run into a conflict for trying to take a "legitimate" place citizen. Urban parking. Services are paid. Price per hour falls with increasing downtime. These parking lots are located on the ground and be a multistoried underground. On the municipal parking ticket may issue a special employee or machine. Private parking. There are legal and not. Places usually always there, but it is mainly the merit of relatively high prices, which increased during the holidays and weekends, varies depending on the area and time of day. Do not leave the rented car on the night of the unguarded parking lot. Within the city you can not move at a speed exceeding 50 km / h.
Beyond the limits of the city speed should not be greater than 90 km / h.
On the road it is allowed to accelerate to 110 km / h.
On the highway, you can travel at speeds up to 120 km / h.
Permitted by law the blood alcohol content of the driver, which does not exceed 0.5 ppm. If this value is greater, the offender faces a fine of more than TL500. Observing the rules of the road in Istanbul, keep in mind that many Turkish drivers are extremely inattentive and like to drive fast. In addition, they often break the various requirements do not include a stop signals, turns, sometimes ride at night without switching. We must be careful not only to themselves but also to other road users to travel to the beautiful city not turned into trouble. One should not try to bribe police officers, when they stopped the car for the violation - it is fraught with even greater penalty. Be careful and cautious driving, follow the rules, and then the rest in Istanbul will leave many pleasant memories.